Celebrating Queen Elizabeth II and Prince Philip’s 70th Wedding anniversary, Le Cordon Bleu reveals the replica of the royal fruit cake. In celebration of Queen Elizabeth II and Prince Philip’s 70th Royal Wedding Anniversary, Le Cordon Bleu London was asked to recreate the 9ft tall Royal Wedding Cake to be part of an ITV documentary, A Very Royal Wedding broadcasted on Monday 30th October 2017. Picture credited to Harry Page. 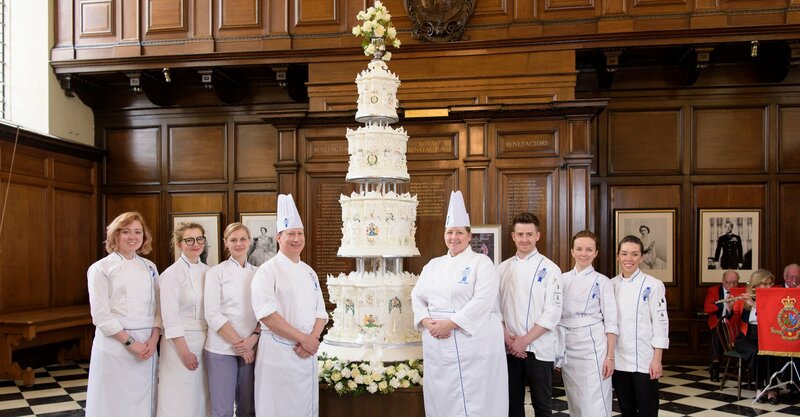 The iconic cake has been recreated by Head Pâtisserie chef Julie Walsh and Chef Matthew Hodgett at Le Cordon Bleu, with the support of the institute's Pâtisserie team and students, who spent months researching, baking and decorating the 4 tiered cake to match the original Wedding Cake of 1947. 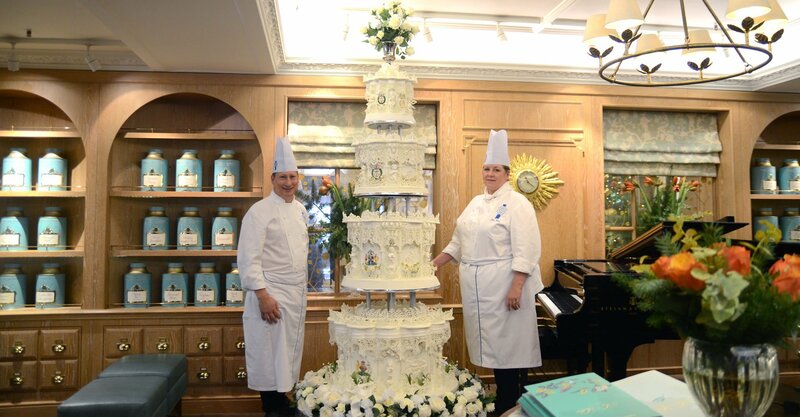 Standing at a staggering 9 ft tall, the cake weighs 500 lbs and contains an incredible amount of ingredients – 60 lbs of butter; 55 lbs of sugar; 750 eggs, 160 oranges and 80 lemons and 3 litres of navy rum. On Monday 20th November 2017, Le Cordon Bleu was honored to present Her Majesty The Queen with a special gift in the celebration of 70 years of marriage, offering the top tier of the Royal Wedding Cake replica. Based on archives and photographs, the fruit cake was meticulously made to size and clothed in white royal icing, including the intricate decorations. Le Cordon Bleu has a rich history of spectacular events. In 1953, the institute was involved in the Coronation Day banquet with the confection of the menu’s original dish ‘Poulet Reine Elizabeth’, which today translates to Coronation Chicken. Proud to be part of such an exceptional event, Le Cordon Bleu continues to provide excellence in the training provided to its students, and showcase the high expertise of Le Cordon Bleu Master Chefs worldwide on a number of occasions. Following much excitement around the Royal Wedding Cake over the last few weeks in the media including Good Morning Britain ITV live show, it is now on public display at the most fitting of venues – The Diamond Jubilee Tea Salon at Fortnum & Mason, London, which was opened by The Queen in 2012. The cake will be available to view from 21st November for two weeks and really is a spectacle to behold. Various tiers of the cake will then be distributed to pensioners at the Royal Hospital Chelsea as well as other nursing homes and charities with which The Queen is aligned. For more detailed information about how Le Cordon Bleu Master Pâtisserie Chefs recreated the Royal Wedding Cake, please following the links below. How Was the Queen’s Royal Wedding Cake Baked?